TSPSC Senior Steno posts 2018 Recruitment, Apply Online Sr Steno in Chief Commissioner Of Land Administration and Home Department in Telangana State. Recruitment Department: in Chief Commissioner Of Land Administration Department and Home Departmentin Telangana State. Applicants must possess the qualifications from a recognized University/Institution as detailed below or equivalent thereto, as specified in the relevant Service Rules, indented by the departments as on the Date of Notification. 1. “Must hold a Bachelors Degree of any University in India established or incorporated by OR under a Central Act, State Act OR Provisional Act OR an Institution recognized by the University Grants Commission OR any equivalent qualification”. 1. Must have passed the Government Technical Examination in Short hand and Type Writing by the Higher Grade in the concerned language conducted by State Board of Technical Education of TS Government OR any other equivalent qualification. TSPSC Senior Steno Recruitment 2018 Notification - 19 Senior Steno Posts: Telangana State Public Service Commission (TSPSC) issued TSPSC Senior Steno Recruitment 2018 Notification (14/2018) for the recruitment of 19 Senior Steno posts in Chief Commissioner of Land Administration Department and Home Department of Telangana State by Direct Recruitment. 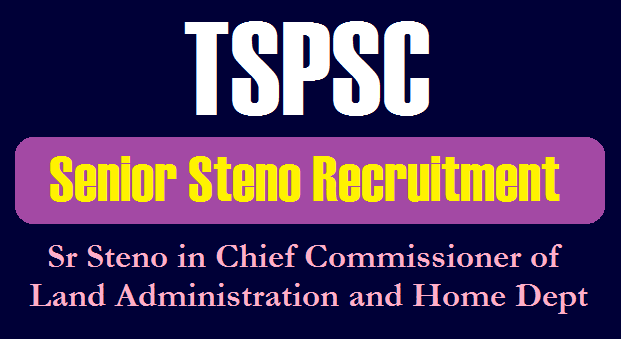 Eligible candidates can apply online for TSPSC Senior Steno Recruitment 2018 through tspsc.gov.in from 11.06.2018 to 02.07.2018.TSPSC Senior Stenos Online application form, How to apply for TSPSC Senior Stenos Recruitment, Last date to apply for Senior Stenos, Application fee, Eligibility Criteria, Senior Stenos Hall tickets download date, Senior Stenos Results date and more details are time to time available at tspsc website.